The world's most seemingly toxic lakes are under threat. And they are also home to one of our most familiar birds: the flamingo. All flamingo species have evolved to live in some of the planet's most extreme wetlands, like caustic "soda lakes", hypersaline lagoons or high-altitude salt flats. One species, the lesser flamingo, has taken this relationship to the limit. Most are found in super-alkaline lakes throughout Africa's Great Rift Valley, which host immense blooms of microscopic blue-green algae (called cyanobacteria). These poisonous plants produce chemicals that, in most animals, can fatally damage cells, the nervous system and the liver. The lesser flamingo, however, can consume enormous amounts with no ill effects (unless you count their colourful plumage, which comes from a pigment in the algae). 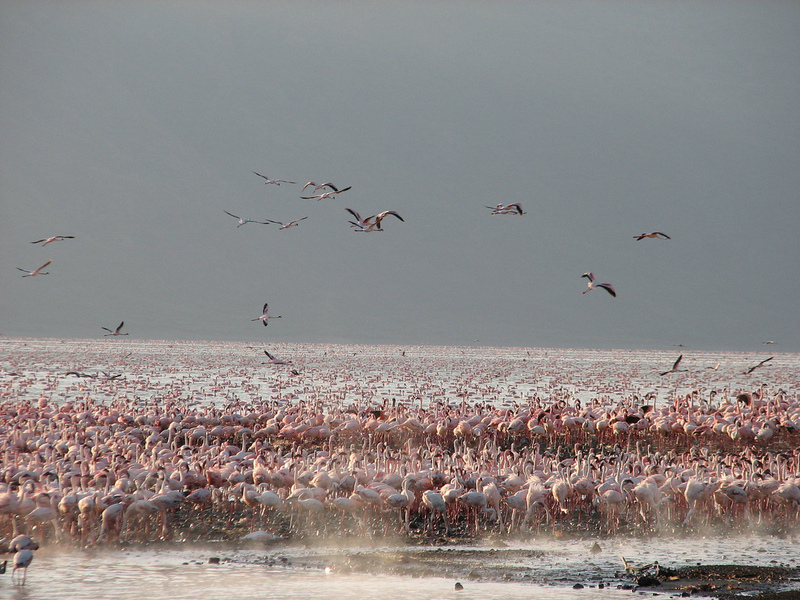 Two of the lesser flamingo's preferred habitats, Lake Bogoria in Kenya and Lake Natron in Tanzania, are hypersaline and hostile to practically all other forms of life (Natron water can even strip away human skin). For the flamingos this a bonus. Special tough skin and scales on their legs prevent burns, and they can drink water at near boiling point to collect freshwater from springs and geysers at lake edges. If no freshwater is available, flamingos can use glands in their head that remove salt, draining it out from their nasal cavity. With few other animals able to cope in such conditions, there is minimal competition for food, and these toxic wetlands are home to massive flocks. Million-strong gatherings provide several benefits. Mass synchronised nesting gives flamingos the best possible chance to raise the maximum number of chicks, while on choppy days a dense mass of birds swimming together also helps create the optimal feeding environment (still water) within the centre of the group. Sheer numbers also make it harder for predators like hyenas or jackals to identify individual victims. As such, a single flamingo is not a happy flamingo. The species is happiest in huge gatherings, and these won't occur around any old lake – the lesser flamingo specifically needs its toxic, salty paradise. But these places are rare. Across the six flamingo species, there are only 30 or so regularly used breeding sites worldwide and, while the global population of around 3.2 million lesser flamingos is impressive, it is largely reliant on a few huge groups (about 75% nest at Lake Natron alone). What if something happens to one of their highly-specialised breeding sites? Unlike many other species that can still breed in smaller populations as their habitats become damaged, these birds cannot easily survive in small groups. Having evolved in such a hostile environment with few rivals, they would have trouble adapting to a more competitive lifestyle elsewhere. With most of their eggs in one toxic basket, the lesser flamingo is unusually vulnerable for a species with millions of individuals. Indeed, the number of lesser flamingos in the wild is already decreasing each year. And humans are to blame. Wetland habitats have been polluted by agricultural chemicals and sewage, feeding and breeding grounds have been disturbed, and declining algal blooms mean some populations are starving to death. Even a diet of toxic algae can't save flamingos from ecological disturbances. If humans take too much water from a lake, or climate change causes excess evaporation, then salinity levels will become unstable. Populations of cyanobacteria can explode and the birds end up consuming new species which can poison them and cause mass deaths. 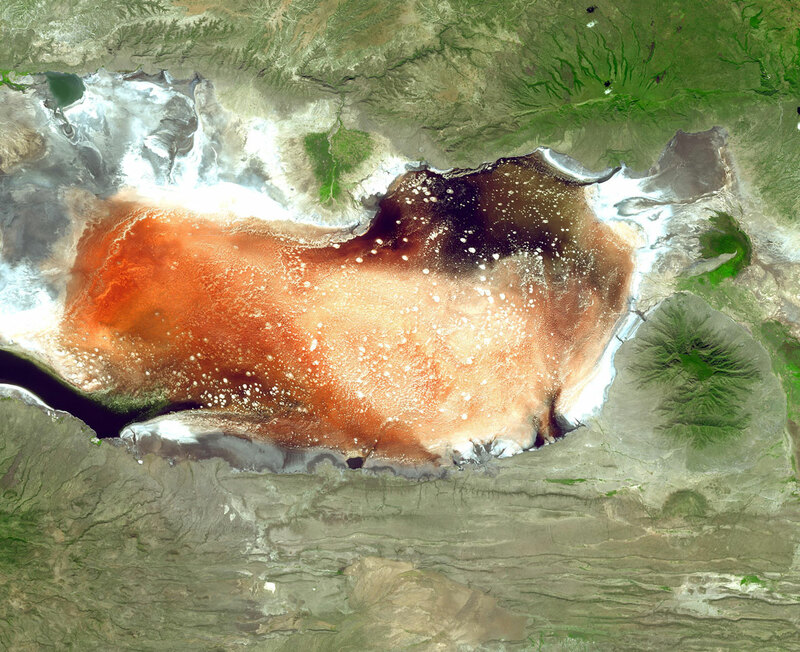 Attempts to extract sodium carbonate (a useful industrial material known as soda ash) from Lake Natron represents another danger. Mining would disturb the birds, who like privacy when breeding and tend to nest far from shore, on remote islands that have been isolated by flooding. It would also make the water more choppy, affecting their food gathering. Given how slow flamingos are at adapting and changing to new nesting areas, any Natron development must be avoided. Anthropogenic disturbances have previously caused lesser flamingos to abandon suitable breeding sites, and back in 1993, polluted water in Lake Bogoria and nearby Nakuru killed more than 20,000 lesser flamingos – the first of a series of recurring deaths. The latest mining proposal has been withdrawn but such developments haven't been completely shelved. Conservation groups remain alert. Monitoring and protecting the population at Lake Natron is the top priority for lesser flamingo conservation, according to a recent assessment by BirdLife International. Large-scale soda ash extraction, the report says, would be "disastrous for the species" and could see the flamingos become officially "vulnerable" or even "endangered". The importance of these unique, and apparently hostile, wetlands is clear to see. Life in the Rift Valley lakes is a delicate balance. And it is clear that we are already harming these unique and fragile ecosystems. If humans were to cause drastic changes, their spectacular pink inhabitants would vanish forever. For the second year in a row, a rare black flamingo has made an appearance at the Akrotiri Salt Lake on the island of Cyprus.